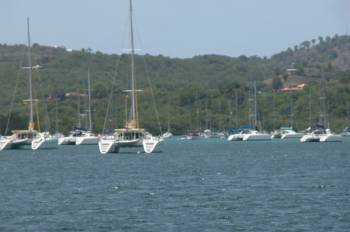 For experienced sailors, it is thrilling to sail among the four main islands: Martinique, St. Lucia, St. Vincent and Grenada. They are far enough apart to allow for open ocean sailing and they lie across the easterly trade winds, making passages north or south easy. The Windward Islands are at the southern end of the Caribbean island chain. 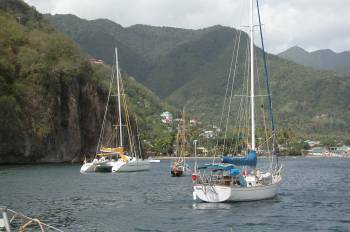 For experienced sailors, it is thrilling to sail among the four main islands: Martinique, St. Lucia, St. Vincent and Grenada. They are far enough apart to allow for open ocean sailing and they lie across the easterly trade winds, making passages north or south easy. With constant 10- to 25-knot winds, the sailing is among the best in the world. Anchoring nightly in peaceful and protected anchorages gives sailors freedom to explore and soak up British and French island culture. The Windward Islands comprise four separate countries; it is mandatory to clear in and out of each one. Upon arrival, anchor in a port of entry and hoist a yellow flag. The boat skipper goes ashore and seeks out the customs and immigrations officers. Crew members remain on the boat until cleared. The skipper must bring the required passports, crew list and ship's papers (including the yacht's name, tonnage, crew members and home port). Always bring the previous clearance with you. The customs charges vary from island to island and are paid in cash. In French-speaking Martinique, the currency is the euro, and in the English-speaking islands it's the Eastern Caribbean dollar (EC). The first step in planning a charter is to decide how many islands to visit given your time frame. Research charter companies and determine which island you want to have as a base; then you can plan an itinerary for the week, taking into consideration distances between islands and factoring in activities like island exploration, scuba diving, snorkeling, volcano hiking and shopping. Charter companies offer packages that include airfare. A connection through San Juan is required to reach the Windward Islands via small turboprop aircraft. The most important part of planning a sailing trip is choosing your crew members. It's common to experience and hear about personalities clashing on charters. When this happens, time and money is wasted on what could have been a great trip. Choose people who have had at least a little sailing experience. Just as a captain on an airplane has the final say, so does a captain of a boat. One last thing: Remember to conserve water on a boat and read up on sailing etiquette 101.